At this the audience burst into laughter: Yet another absurd Hollywood twist. It wasn’t the late Hall’s finest moment — in fact, he’d done the scene reluctantly. But afterward he held out hope that “When Were You Born?,” the first major motion picture to treat the subject of astrology seriously, might help “open the way for a great cycle of occult philosophy,” he wrote. The film was a bomb, but the fact that this obscure clip was being screened before a sold-out crowd of artists, intellectuals and spiritual seekers shows that the cycle of Hall’s influence continues. 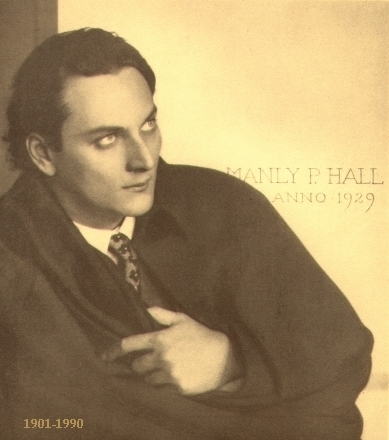 And it may grow in the coming months, for Process Media has just published “Master of the Mysteries,” the first biography of Manly Palmer Hall, written by Louis Sahagun (who is a staff writer at The Times). In his lifetime, Hall befriended notables as disparate as Bela Lugosi and John Denver. For his writings alone he was made an honorary 33rd-degree Freemason (the highest honor), and even Elvis was a fan, sending Priscilla Presley to one of the world renowned orator’s lectures because he was afraid of getting mobbed himself. The year Hall arrived in Los Angeles, 1919, was the year the city started to boom. “It’s a fascinating parallel,” Sahagun said. “Southern California in general was the last best place, a place of new beginnings.” To Sahagun, Hall’s journey was “the spiritual equivalent of the California dream,” and when he decided to write “Master of the Mysteries,” he wanted it to be as much a history of mystical Los Angeles as a biography. A junior high school dropout from a broken home, Hall was regarded by many as a magician, but to Sahagun he was really a “one-stop scholar of ancient ideas.” One of Hall’s first friends was Sydney Brownson, a phrenologist with a booth on the Santa Monica Pier, who shared his knowledge of Hinduism, Greek philosophy and Christian mysticism. Hall, who had a photographic memory, furthered his studies of ancient religions and soon was speaking at the Church of the People downtown. By 1920, only 19 years old, he was running the church and delivering Sunday lectures about Rosicrucianism and Theosophy, the mystical philosophical system founded by Madame Helena Blavatsky; as well as the teachings of Pythagoras, Confucius and Plato. Hall became the beneficiary of Caroline and Estelle Lloyd, a wealthy mother-daughter duo from Ventura, and in 1923 their generosity enabled a trip around the world that would provide the inspiration — and the information — for his encyclopedic masterwork, “The Secret Teachings of All Ages.” The publication of this lavishly illustrated, oversize text, which sold for $100 in 1928, turned Hall into an icon — no doubt partly thanks to the dramatic portraits done by his friend William Mortensen, a Hollywood cameraman who had also photographed Jean Harlow and Cecil B. DeMille. Yet for all his mental discipline, Hall was in terrible physical shape, with great folds of sagging flesh around his middle (Sahagun describes him as “avocado shaped”). According to Sahagun, Hall, when asked what he would wish for if he were given one wish, said that he would like to be placed in a swimming pool full of chocolate pudding so that he could eat his way out. Nor did his vast knowledge help his personal relationships. Hall was married twice, the first ending with his wife’s suicide; the second, almost 20 years later, was to a woman who was emotionally abusive and was classified by the FBI as a certifiable nuisance. Both marriages were childless. Sahagun doesn’t believe Hall’s second marriage was ever consummated, and there were rumors that he might have been gay. Whatever the case, this was a man who lived primarily in the world of books and ideas, and also one, it’s important to note, who had always warned of the dangers of putting spiritual leaders on a pedestal. “That sets him apart from, say, a Deepak Chopra, who titles a book ‘Defying the Aging Process,’ ” Sahagun said. In the ultimate, final tragedy, this man who believed in reincarnation and who had planned to leave the earthly plane consciously, might have been the victim of a greedy plot devised by his assistant Daniel Fritz, who rewrote Hall’s will. Hall’s body was found under suspicious and horrifying circumstances, apparently dead for hours and with thousands of ants streaming from his nose and mouth. The case was never solved. Not surprisingly, this was the beginning of a low point for the Philosophical Research Society, which sold rare alchemical texts to the Getty to pay for some of the legal fees incurred by Hall’s widow. Today, however, the center is on an upswing. In 2002, the society formed a distance learning university, offering a master’s degree program in consciousness studies, with faculty including Jonathan Young, a protege of Joseph Campbell, and Vesna Wallace, a professor in the religious studies department of UC Santa Barbara. This January, the university received national accreditation. The library, featuring some of the rarest philosophical, religious and occult texts in existence (books on black magic and Satanism are stored under a Buddha to balance the energies), remains open to the public every Saturday and Sunday. “People are hungry for the material,” said society librarian Maja D’Aoust, who co-authored the alchemical primer “The Secret Source” with Adam Parfrey and lectures most Sundays.